Bulimia (usually defined as binge eating followed with laxatives, vomiting, diuretics or compulsive exercise to purge the body) is a lifestyle. My Relieve Bulimia Hypnosis MP3 will help you use hypnosis to deal with symptoms of bulimia. Symptoms, apart from the major one of purging, vary from one person to another. This Relieve Bulimia Hypnosis MP3 audio enables the bulimic to imagine herself behaving differently. Thus, the people-pleasing bulimic mentioned above, who is tired of always being a giver, could use my Relieve Bulimia Hypnosis MP3 session to imagine herself instead dealing with her rage and resentment in constructive ways. Freedom from the need to purge can be encouraged with post-hypnotic suggestions. That is, suggestions given while you are in hypnosis but which take effect after the session. Usually more than a post-hypnotic suggestion would be necessary to eliminate bulimia. Even the most powerful post-hypnotic suggestions fade over time unless there is reinforcement (by yourself or with the therapist) or a profound change in lifestyle. A main factor in the healing of a bulimic is the attention and validation offered by the therapist to the person seeking help. So, even without hypnosis, simply enjoying the experience of the professional encouraging and endorsing your feelings, is therapeutic. What this hypnotherapy MP3 offers you is a method to continue the healing by yourself. There are several theories about why people become trapped in this cycle of self-abuse. These fall into three main categories: Social; Family; and Individual. Each, of course, is intimately linked with the others. My overcome Bulimia MP3 helps on the individual level which in turn can influence the family and the social aspects. Sufferers of bulimia have found relief through hypnosis. When their mindset and body image, self-esteem and need for control all take over and cause them to use food or a lack of food to feel in charge, then the only solution is a mental change. Bulimia is a disease that most often strikes young women with low self-esteem. It is characterized by excessive eating of food, especially junk food, and then trying to rid the body of the food quickly by either self-inducing vomiting or taking strong laxatives. It is estimated that between 3 and 10 percent of adolescent and college-aged woman suffer from this pattern of secretive eating and purging. The long term health effects can be devastating and even deadly. It is sometimes an illness that goes along with anorexia where the person suffering from the illness refuses to eat because they see themselves as overweight even though they are often extremely underweight. Hypnosis changes the way a bulimic person views food and their body. Since this is a serious medical condition and can become an addiction similar to that of drugs or alcohol, anyone using hypnosis to aid in changing their thinking also needs to seek medical attention for the potentially dangerous physical health risks they may have. A program of self-hypnosis works hand-in-hand with medical care by addressing the real causes – the lack of confidence, the poor self image, the need for control – while a medical doctor can ensure nutritional needs are being met. 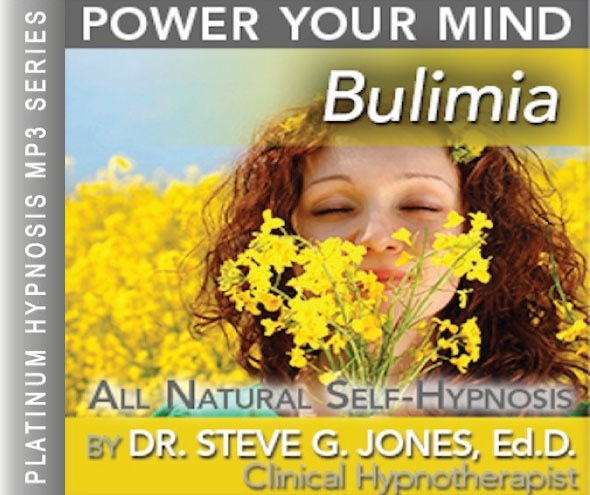 Steve G. Jones designed his Relieve Bulimia Hypnosis MP3 program to help create a more positive self image. Through a carefully related script, the messages needed to take complete control of your life and eating habits are established. By changing your thinking, you can change your eating and develop a healthier body. Steve G. Jones achieves AMAZING and LASTING results!!! Hypnosis is the easiest way to affect change in your life because the positive messages go straight to your subconscious mind effortlessly so you can accomplish your goals and reach for the stars!! All you have to do is listen to the Relieve Bulimia Hypnosis MP3 download at night as you go to sleep!!! You’ll hear soft music, the gentle sounds of the beach, and the soothing sound of Steve G. Jones’ voice all working together to bring about positive changes in your life easily and naturally. Steve G. Jones has been helping people improve their lives with hypnosis for over 17 years…now it’s time for him to help YOU… don’t wait, do it NOW !!! you’ll be glad you did. See you at the top! And as you continue to relax, you feel so at peace with yourself, so completely at peace with yourself. And you realize now how powerful you are and that you can let go of binge eating and when you do eat, you feel completely in control, completely in control. You realize that your self-worth comes from your integrity. Your self-worth comes from the inside from what is in your heart, your integrity. And you realize now that you have an amazing amount of integrity and therefore an amazing amount of self-worth. And you realize what a wonderful person you are. What a wonderful, relaxed person you are. You continue to relax as you now imagine seeing yourself as the beautiful person you are. Seeing yourself as though in a mirror, seeing your physical body and the person inside. Realizing that both are beautiful, both are worthy of love and you are able to talk about your feelings freely, letting go of self-doubt, letting go of any anger, relaxing more and more, day by day. And you realize that all of your actions happen with consideration of the consequences, therefore you take appropriate actions in your life and you are very responsible. You handle your life in a very responsible way. Most importantly, you are kind to yourself. You are kind to yourself. You are kind to yourself. Bulimia is a very serious eating disorder that can have negative emotional, behavioral, mental, and physical effects on the body. If you or someone you know has bulimia, realize that the disorder should not be taken lightly and there are things you can do to get help. People with bulimia have a very distorted view of their body and often take extreme measures, such as purging, to lose weight. This powerful hypnotherapy recording will help you improve your body image and work on getting your body and mind back to a healthy state. This self-hypnosis session is designed to target your subconscious mind and give it powerful and positive suggestions so that you can control over bulimia. It is extremely important that you overcome bulimia and allow your body to heal. This hypnosis session will give you the positive body image and self-confidence you need in order to overcome bulimia. You do not have to suffer anymore. You can feel good about your look and your body. We encourage you to seek hypnotherapy to help you overcome bulimia. Hypnosis has long been recognized as an effective tool for producing behavioral change in the eating disorders anorexia and bulimia (Unconscious Agendas in the Etiology of Refractory Obesity and the Role of Hypnosis in Their Identification and Resolution: A New Paradigm for Weight-Management Programs or a Paradigm Revisited? ).